A US window cleaner has won the first ever Window Cleaning World Cup today (Wednesday March 20) – ahead of the current world record holder. Window cleaners came from across the globe to take part in the competition – and make an official Guinness World Record attempt – at The Cleaning Show trade expo at London’s Excel convention centre. 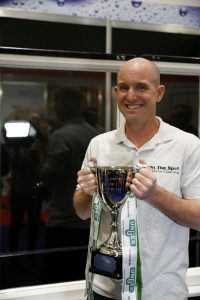 Jeremiah Hickey, already the fastest window cleaner in the US, became the world champion with a time of 17.02 seconds, scooping a £1,000 cash prize and the trophy. He said: “I was really surprised. To hear my name as the winner at the end, I was totally floored. Jeremiah, who is 42 and runs On The Spot Window Cleaning California, was crowned overall winner in the USA’s Speed Window Cleaning contest held in San Diego earlier this year. Entrants in today’s Window Cleaning World Cup came from England, Scotland, Ireland and Wales as well as from overseas. They included the current fastest widow cleaner in the world, Terry ‘Turbo’ Burrows, from Essex, who set his first Guinness World Record in 1995 on BBC1’s Record Breakers. He went on to set two more record times in 2005 and in Blackpool in 2009, including the current world record of 9.14 secs. The Swedish champion Jimmy Strom also competed, coming second. Terry himself came in third.